We have been humbled and moved by the support and coming together of such amazing people who want to make it better for those living in remote Australia. As you will read in this edition, whether it’s being able to see parts of Australia most people miss or making new friendships, our volunteers say they gain so much from giving their time to lend people in the bush a helping hand. 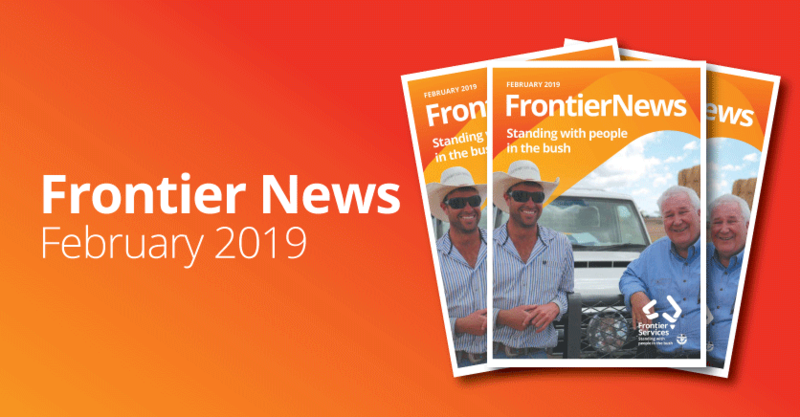 In our February Frontier News, we also introduce you to Rev David Ellis, from our McKay Remote Area in north west Queensland. During production of this issue, we learned of the devastation wrought by floods and bush fires across much of remote Australia. Many of these regions were already struggling through years of relentless drought. If you or someone you know want to become a volunteer, please call us on 1300 787 247. If you know someone in remote Australia in need of a helping hand, please ask them to reach out. They can complete our online contact form or call our Outback Links team on the above number to see how we can be of assistance.